fell in love with that magical place and dreamed of running through the Alps with long braided hair. That dream became a reality one summer when I was in high school and my grandparents, who no longer lived in Switzerland, took me back there with them. We spent weeks riding trains, exploring rugged mountain sides, visiting quaint villages, and eating lots and lots of chocolate. To experience in real life, what I had imagined for so many years in my favorite book, was truly a dream come true. Books have this magical ability of transporting you to another time and place. I love the feeling of getting lost in a story. 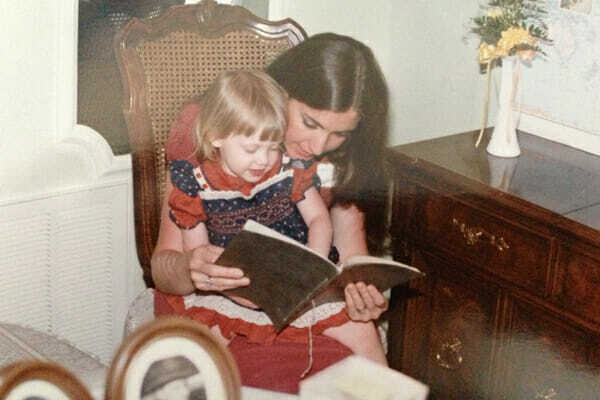 While looking for some photos of my Switzerland trip, I came across this one of my mother reading me a story when I was probably about two. I don’t think I’d ever seen this photo before and the moment made me smile! In attempts to limit screen-time in our house, we’ve started reading longer books to our kids. Our older two boys are at a good age now where they can actually sit and listen so our bedtime routine these days involves me taking care of the crazy three year old so the big boys can listen to their Dad. Listening to Dad read isn’t difficult because he is the best story teller. He’s got the gift of accents and has a special voice for every character. After falling in love with Harry Potter, we’re starting the classic Treasure Island with a theme my kids never tire of: Pirates. Some other trends have come and go in our house, but swash-buckling pirates is one that sticks around. 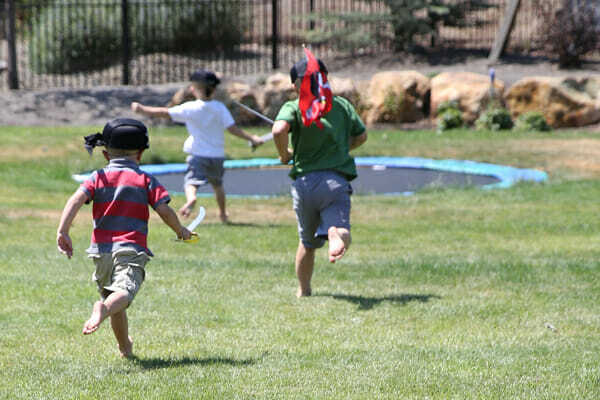 I see my boys on a regular basis running by with eye patches on and fake swords in their pants. It’s a make-believe world I hope they take a long time to grow out of. 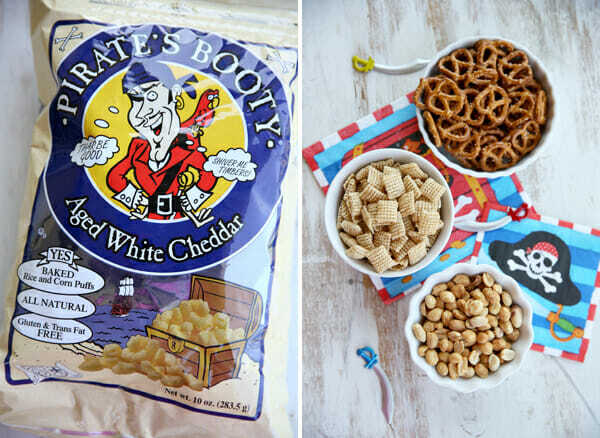 With a love of all things pirates, Pirate’s Booty is a family favorite. Those yummy cheddar-dusted puffs are crazy addicting, which is why we buy them in bulk from Costco and I hide one bag for myself. Don’t judge. I’ve had a recipe idea in my head for literally years, and I finally tried it out the other day, and then promptly kicked my own behind for not doing it sooner. 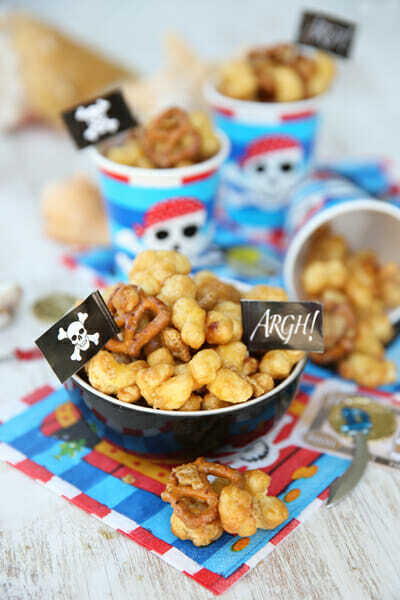 You’ll need some Pirate’s Booty (or something similar, see my notes in the recipe), and some pretzels, rice chex, and roasted peanuts. All good snacky things, yes? 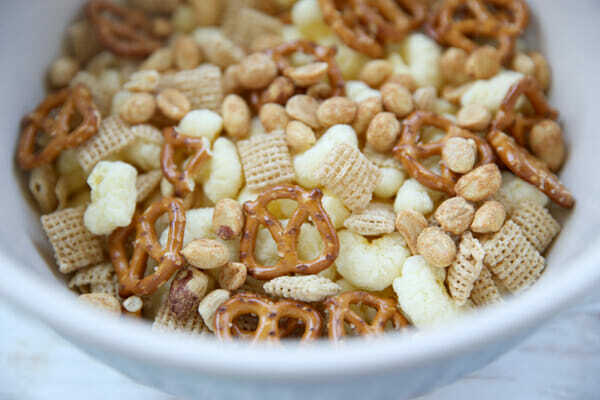 We’ve got airy, cheesy puffs, the light and crispy chex, the crunchy, salty pretzels, and little hints of peanutty goodness. Wanna see how I’m going to make it amazing? Yes, we’re totally doing this. 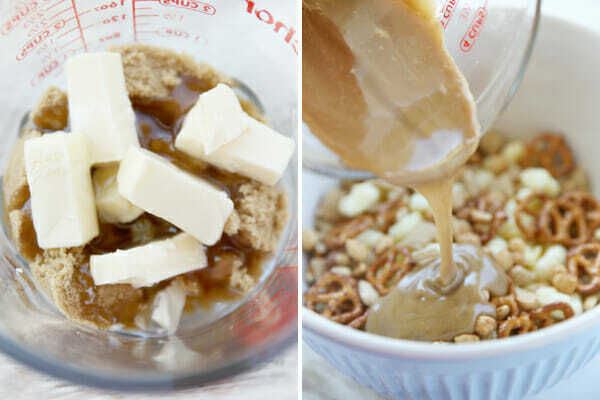 A quick homemade caramel in the microwave takes all those amazing snacky things and makes them go c-r-a-z-y with deliciousness. When it’s all mixed up, I bake it in the oven for just a few minutes to set the caramel. When it cools, it’s crunchy and sweet. If you’ve ever had those popcorn mixes that combine cheesy popcorn and caramel popcorn, you get a little of that same thing going on here. It’s a sweet and savory party in your mouth. And guess what? Kids sit even longer listening to stories if they’re eating something yummy. True story. Make some for your next party, or bbq, or family movie night, or reading time snack. You’ll be the most popular person in the room- Our Best Bites Promise! Before I give you the recipe, I just want to say that we’re so happy to be partnering with jetBlue on this post, spreading a message we’re passionate about! Their Soar with Reading program is designed to encourage kids’ imaginations to take flight through reading and get books into the hands of kids that need them. This year, JetBlue has partnered with Random House Children’s Books and Magic Tree House author, Mary Pope Osborne to encourage children to share the magic of reading, and you can help! As part of Soar with Reading, JetBlue and Random House are asking children – what magical places would you like to travel to with Jack, Annie and JetBlue this summer? Kids can create their own adventure and then ask their parents to share their story here. Participants will be entered for a chance to win a $5,000 college scholarship or other great prizes. And the most important part of the mission is to get $500,000 worth of books into the hands of children everywhere! For every sweepstakes entry, JetBlue will donate one book, up to $500,000 worth of books, to Mary Pope Osborne’s Classroom Adventures Program. Check out the link here, and enter your adventure today! Preheat oven to 300 degrees. 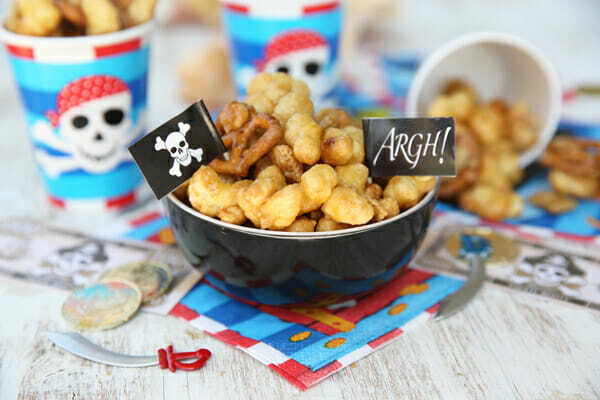 In a large mixing bowl, combine Pirate’s Booty, Chex, pretzels, and peanuts and set aside. In a large glass measuring cup (or large microwave safe bowl- I use a 4C Pyrex measuring glass) combine brown sugar, butter, and corn syrup. Microwave for one minute and stir to combine. Heat again for 1 minute on highest power level and remove and stir. Stir in baking soda and mix well. 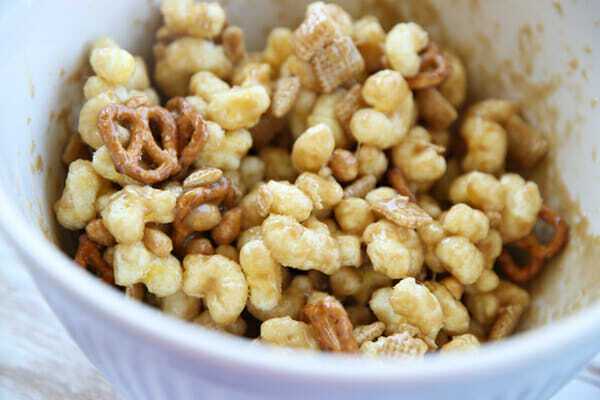 Pour caramel over snack mix and stir to coat everything. Place mixture on prepared baking sheet and bake for 15 minutes, stirring half way through. Let cool completely and then break into pieces. 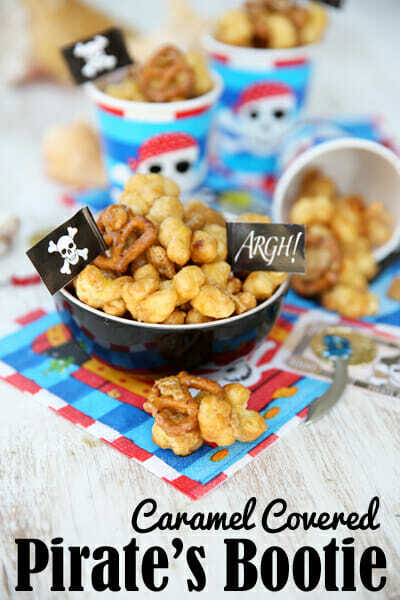 *Pirate’s Booty is a snack puff made of corn and rice and dusted with white cheddar. It’s sold in the snack aisle of most major grocers. I can always find it at Target. If you aren’t able to find it, there are several similar products that would work, including even white cheddar popcorn. If you missed note about our new Pin-it feature, it’s so cool! Just hover your mouse over the image below (or any image in this post) and the pin button will pop up to pin that specific image. Pin away! That snack looks yummy. 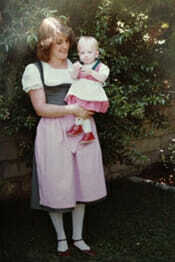 More my favorite part of this post was getting a little glimpse of your life and childhood. I love that you shared some neat childhood pictures and memories, and some fun moments of your cute boys! My aunt makes something similar to this with cashews and pirates booty, but the plain kind. It is delicious. This one looks so good, I love that it mixes sweet and savory. I think that it might be a good treat to send in the mail too. Going to enter the sweepstakes too, I love anything that helps children get books into their hands. Thanks! I made a batch with cashews too and it was soooo good! I remember the first time I encountered this snack at an young adult’s Bible study. I thought it looked weird. But I gave it a try and my eyes widened with delight. The caramel on that puff popcorn stuff totally works. Arrgh, another sweet treat for my arsenal (or ars, as the case may be…). This looks awesome, never would have thought of adding caramel to the cheddar booty. Thanks Sara! So I have a disc bulge. And am in sooo much pain, today especially. BUT. I actually SAT UP when I saw that Pirate’s Booty was an ingredient in this! HAHAHAHA My favorite snack ever. Cannot WAIT to make this! Looks divine! Love you gals! Can you use just the caramel sauce and put it over popcorn and then bake it? Will it make caramel corn? Thank you…I am going to make it this weekend for our Doggies Birthday Party…Not for them, for us..they will get a Doggie Cake!! Happy Birthday to Tonka (8) and Lacie (7) our loveable Boxers. MMmmmm, I LOVE Chicago Style popcorn (minus the plain ol’ butter popcorn), so this is right up my alley! Going to have to make it tomorrow to take on our road trip this weekend!! Oh wow! I don’t think I would be able to have just a small portion of this. Yum! I’m such a sucker for stuff like this. Like, can’t control myself! 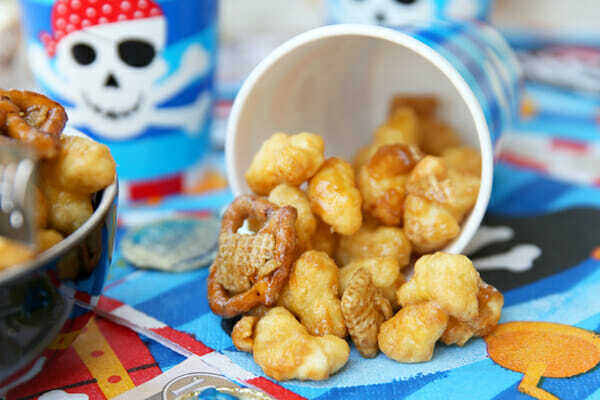 I love that cheddar/caramel popcorn from Costco, so I’ll definitely have to try this!! What a great partnership for a cause with jetBlue! Oh and that snack mix looks so yummy! Sounds amazing! Can’t wait to make it for my BBQ next week! Looks awesome! I wonder if you could “bake” it in the microwave to harden the caramel like your awesome caramel corn recipe? Oh! And while you’re at Costco picking up some Pirate Booty, grab a bag (or two) of the Bare Fruit apples. They’re dried apples slices that are crunchy. I stick a few handfuls in a ziploc bag, crush them with a rolling pin and add them and some cinnamon (never measured, sorry!) to the bag with the popcorn. Then I pour the caramel over all of it and microwave like your recipe says. You should see the looks I get! Thanks for all the great recipes!!! Yep, you can totally bake it in the microwave! And I love those apples- I’m going to try them with caramel! Looks delicious! Would be a good snack for school lunches too! At Costco look for the pecan-cashew nut crisp, in the snack isle with the other nut bags. Crunchy, sweet, tons of cinnamon! Dried PEACHES and apples. Nuff said. I know you are going to get 100’s of suggestions, but here is mine. I started reading the Redwall series by Brian Jacques to my boys at the same age. They are STILL obsessed with it today, at age 14.5y. Rich language, complex plot lines, real good guys, real bad guys and FOOD! Every book has several feasts, and the author always explains what is in every meal. Don’t read if you are hungry LOL. If your DH is good with voices then even better. Oh my gosh they were sampling that cashew-crisp stuff last time I was at Costco. It’s sooo good! And thanks for the book suggestion, I’m going to check that out! My boys are going to be so excited about this yummy treat! Thank you for sharing…I can’t wait to try it. I totally missed something major, here. I see blocks of something in one of those last photos, but it’s not identified. Are those caramels? It doesn’t look like it, but where is the microwave caramel? I’m lost. I made this today and it is delicious! Salty,sweet,cheesy and crunchy. What could be better?! But double the recipe because it won’t last long! I can completely relate to your Switzerland daydreams. My dad was born and raised there and when I finally went it was like experiencing my childhood dreams! I love Pirate’s Booty and now I’m sure the only way to love it more is to cover it with caramel. This looks delicious! Thank you!